How much time did you spend cleaning your teeth this morning? Are you sure it was a full two minutes? Did you give more time to brushing your teeth or to applying your makeup, fixing your hair or shaving? The difference between something good and something great is attention to detail and at Alkali in Putney we want you to have a great smile. Fundamentally, everything comes down to brushing yet the tools for clean teeth and good oral health are always relegated to the bottom shelf and regarded as unglamorous. Unlike your top shelf beauty products which cost you a fortune and you keep on display, your toothbrush, toothpaste, mouthwash and floss get far less attention. While we are on the subject, what condition is your toothbrush in? Is it displaying splayed hairs, have you flattened the head or is it like new? And how much attention do you pay to cleaning your teeth? 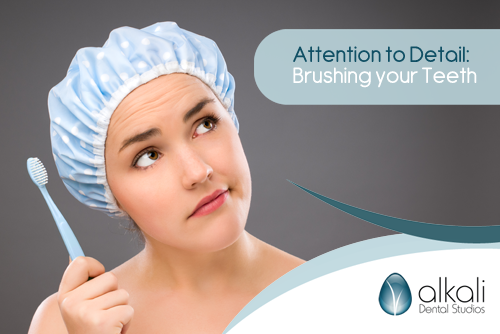 Do you stand in front of the mirror brushing every surface of your incisors and molars, top to bottom, front and back? Or have you got your phone in your other hand and your head in your closet picking the day’s outfit while looking for your shoes and paying little attention to brushing whilst white paste dribbles down your chin? Do you clean your teeth morning and night, floss and use mouthwash? According to the British Dental Health Foundation one in three people have never flossed, one in four have never used mouthwash and a third of men do not brush their teeth twice a day. That might sound shocking to you, but Alkali sees the evidence of poor oral hygiene and would like to change the habits of a nation. A perfect smile, regarding how attractive your friends and colleagues perceive you to be, is more important than any other aspect of your persona. Even if every hair is in place, you are tall and slim and have lovely eyes, it is the one with the fantastic smile who will be seen as the most beautiful, not the one with the scummy teeth. As the infamous Don Quixote said “Every tooth in a man’s head is more valuable than a diamond,” but how many of us take care of our teeth as well as we would a gift from Tiffany’s? Infected gums can cause a multitude of health issues as well as leading to tooth loss. A good mouthwash used the last thing at night after brushing your teeth, along with regular check-ups with your dentist and visits to a qualified hygienist to have your teeth professionally cleaned, will not only prevent periodontal disease but other intrinsic health problems. Your hygienist will show you how to brush your teeth correctly and how to floss. Flossing is a much-neglected part of our daily routine even if we rank amongst those who take care how they brush. We are more inclined to see our legs are regularly waxed even in the depths of winter when they are hidden from view, or rush to the hairdressers to get our roots coloured, but we remain indifferent when it comes to seeing every aspect of our teeth and gums are scrupulously clean. There is more of a craze for threading eyebrows than for gently pulling a thread of floss through our teeth to protect our gums. Next time you are out shopping for a new moisturiser or mascara, take some extra time to treat yourself to some beautiful essentials to keep your teeth looking as lovely as the rest of you and put them on the top shelf. The extra time you spend paying attention to your teeth will be the most worthwhile thing you do today and every day.